Welcome to the Artists of Wine Country! The work of nine members of the Artists of Wine Country will be featured on the 2014 October Art Walks and Talks. The purpose of the free Art Walks is to share the artistry of Hermann artists with the public and to raise scholarship money through donations. Scholarships are giving annually to Hermann students who are planning to major in the arts when they attend university. The Artists of Wine Country was established initially with the support of Hermann Tourism in 1999 to offer Studio Tours in the area and continues to offer Art Walks and Talks each October in the downtown historic district. To date, through the generous donations of Hermann students, visitors, and the artists themselves, the Artists of Wine Country have presented twelve $1,000 scholarships. Alice Jacobson was one of the founding members of The Artists of Wine Country and the scholarship was named in her honor when she passed away. 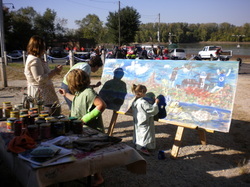 Everyone who came on the free Art Walk in 2011 got to participate in the Project People Paint at the Kunsterhaus Gallery on First Street. What a magnificent art mural they created!